Members of Arnold, Maryland’s, Gloria Dei! Quilters stand in front of three of the quilts they have on display in Gallery 90 while holding another they donated to Hospice of the Chesapeake while visiting during the “Wrapped in Love” exhibit’s reception. Pictured from left are Irene Lauermann, Donna Baronti, Phyllis Hauge, Pam Neidig, Jill Lowe and Mary Linda Dreibelbis. Photo by Elyzabeth Marcussen, Hospice of the Chesapeake. 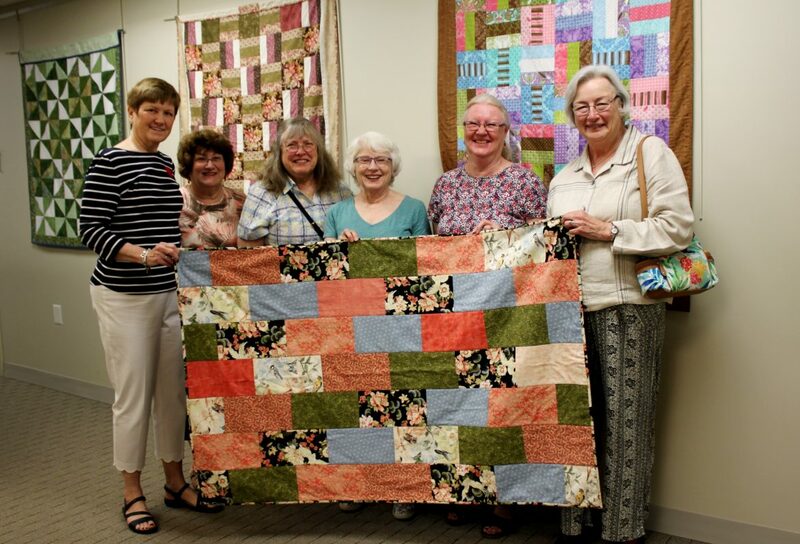 Local quilters had an opportunity to see their work on display as well as enjoy other quilters’ work at a reception held June 8 at Hospice of the Chesapeake. The event was to celebrate “Wrapped in Love,” an exhibit of some of the many lap quilts created and donated by individuals and guilds to bring comfort to patients in Anne Arundel and Prince George’s counties. The exhibit is on display through June 20 in Gallery 90, the art gallery located throughout the nonprofit’s administrative building on the John & Cathy Belcher Campus, 90 Ritchie Highway in Pasadena. Local quilting circles have provided hundreds of lap blankets with a patriotic theme to give to Veterans as part of Hospice of the Chesapeake’s Honor Salutes over the past several years. They also have crafted quilts for its other patients, including whimsically themed designs for pediatric patients. Of the quilts gracing the walls through June 20, one will see works by the Down’s Park Quilting Club, Friendship Quilters, Gloria Dei! Lutheran Church Quilters, Great Circle Quilting Club and Cathie Logie. Other guilds regularly donating to patients include Comfort Quilters, Eternal Quilters, Faith Baptist and St. Paul Lutheran Church of Crofton Quilters. One guild that crochets afghans is Patterns of Faith. To schedule a private, docent-led tour of the exhibit, contact Renate Little at 443-837-1512 or rlittle@hospicechesapeake.org.